In my quest to cook ‘healthy food’ comes this version of Chicken biryani which is also loaded with vegetables! Biryani is something every Indian is familiar with and is usually something made on festivals,special occasions or when you have guests/friends over. Whether it’s a ‘Vegetable Biryani’,Chicken Biryani or Mutton Biryani, most families have their own secret recipes. 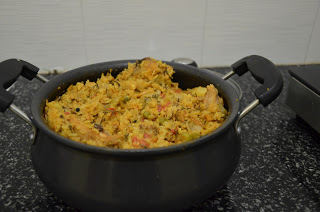 Usually, a chicken/mutton biryani is made without vegetables, but here is my attempt at combining the vegetable biryani with the chicken biryani to ensure my family gets it’s daily dose of vegetables even on special occasions ! Marinate the chicken in a paste made with 1/2 cup yogurt, turmeric, red chilli powder, coriander powder, cumin powder, half of the ginger+garlic paste, half of the chopped cilantro and mint leaves and set aside for at least an hour in the fridge. Heat the oil in a kadai or thick bottomed pan, add the whole spices and let it fry for a minute. Add the remaining ginger+garlic paste, the slit green chillies and the chopped cilantro and mint leaves and fry for another minute. Drain out the water from the basmati rice and add it along with the mixed vegetables and stir for 5-6 minutes. Add the chopped tomatoes,salt and the remaining yogurt and stir till the tomatoes are cooked. Add the marinated chicken and stir for a 5 minutes. Then add about 4 cups of water, cover and cook (with occasional stirring) till the rice is cooked. Serve hot with a mixed vegetable raita. Since I use less oil while cooking(which also drastically reduces the calories in the cooked recipe), I add salt while frying the onions to let it sweat and prevent it from burning.